For the company, see Waste Management (corporation). For other uses, see Waste management (disambiguation). Not to be confused with Sanitary engineering. Waste management (or waste disposal) are the activities and actions required to manage waste from its inception to its final disposal. This includes the collection, transport, treatment and disposal of waste, together with monitoring and regulation of the waste management process. Waste management practices are not uniform among countries (developed and developing nations); regions (urban and rural areas), and residential and industrial sectors can all take different approaches. A large portion of waste management practices deal with municipal solid waste (MSW) which is the bulk of the waste that is created by household, industrial, and commercial activity. The life-cycle begins with design, then proceeds through manufacture, distribution, and primary use and then follows through the waste hierarchy's stages of reduce, reuse and recycle. Each stage in the life-cycle offers opportunities for policy intervention, to rethink the need for the product, to redesign to minimize waste potential, to extend its use. [page needed] Product life-cycle analysis is a way to optimize the use of the world's limited resources by avoiding the unnecessary generation of waste. Resource efficiency reflects the understanding that global economic growth and development can not be sustained at current production and consumption patterns. Globally, humanity extracts more resources to produce goods than the planet can replenish. [page needed] Resource efficiency is the reduction of the environmental impact from the production and consumption of these goods, from final raw material extraction to last use and disposal. The polluter-pays principle mandates that the polluting party pays for the impact on the environment. With respect to waste management, this generally refers to the requirement for a waste generator to pay for appropriate disposal of the unrecoverable material. Throughout most of history, the amount of waste generated by humans was insignificant due to low population density and low societal levels of the exploitation of natural resources as well as industrial since few decades. Common waste produced during pre-modern times was mainly ashes and human biodegradable waste, and these were released back into the ground locally, with minimum environmental impact. Tools made out of wood or metal were generally reused or passed down through the generations. However, some civilizations do seem to have been more profligate in their waste output than others. In particular, the Maya of Central America had a fixed monthly ritual, in which the people of the village would gather together and burn their rubbish in large dumps. Sir Edwin Chadwick's 1842 report The Sanitary Condition of the Labouring Population was influential in securing the passage of the first legislation aimed at waste clearance and disposal. Following the onset of industrialisation and the sustained urban growth of large population centres in England, the buildup of waste in the cities caused a rapid deterioration in levels of sanitation and the general quality of urban life. The streets became choked with filth due to the lack of waste clearance regulations. Calls for the establishment of a municipal authority with waste removal powers occurred as early as 1751, when Corbyn Morris in London proposed that "... as the preservation of the health of the people is of great importance, it is proposed that the cleaning of this city, should be put under one uniform public management, and all the filth be...conveyed by the Thames to proper distance in the country". However, it was not until the mid-19th century, spurred by increasingly devastating cholera outbreaks and the emergence of a public health debate that the first legislation on the issue emerged. Highly influential in this new focus was the report The Sanitary Condition of the Labouring Population in 1842 of the social reformer, Edwin Chadwick, in which he argued for the importance of adequate waste removal and management facilities to improve the health and wellbeing of the city's population. In the UK, the Nuisance Removal and Disease Prevention Act of 1846 began what was to be a steadily evolving process of the provision of regulated waste management in London. The Metropolitan Board of Works was the first citywide authority that centralized sanitation regulation for the rapidly expanding city and the Public Health Act 1875 made it compulsory for every household to deposit their weekly waste in "moveable receptacles: for disposal—the first concept for a dust-bin. Manlove, Alliott & Co. Ltd. 1894 destructor furnace. The use of incinerators for waste disposal became popular in the late 19th century. The dramatic increase in waste for disposal led to the creation of the first incineration plants, or, as they were then called, "destructors". In 1874, the first incinerator was built in Nottingham by Manlove, Alliott & Co. Ltd. to the design of Alfred Fryer. However, these were met with opposition on account of the large amounts of ash they produced and which wafted over the neighbouring areas. Similar municipal systems of waste disposal sprung up at the turn of the 20th century in other large cities of Europe and North America. In 1895, New York City became the first U.S. city with public-sector garbage management. Early garbage removal trucks were simply open bodied dump trucks pulled by a team of horses. They became motorized in the early part of the 20th century and the first closed body trucks to eliminate odours with a dumping lever mechanism were introduced in the 1920s in Britain. These were soon equipped with 'hopper mechanisms' where the scooper was loaded at floor level and then hoisted mechanically to deposit the waste in the truck. The Garwood Load Packer was the first truck in 1938, to incorporate a hydraulic compactor. Waste collection methods vary widely among different countries and regions. Domestic waste collection services are often provided by local government authorities, or by private companies for industrial and commercial waste. Some areas, especially those in less developed countries, do not have formal waste-collection systems. 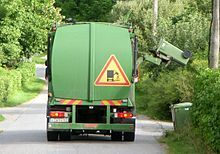 Curbside collection is the most common method of disposal in most European countries, Canada, New Zealand and many other parts of the developed world in which waste is collected at regular intervals by specialised trucks. This is often associated with curb-side waste segregation. In rural areas waste may need to be taken to a transfer station. Waste collected is then transported to an appropriate disposal facility. In some areas, vacuum collection is used in which waste is transported from the home or commercial premises by vacuum along small bore tubes. Systems are in use in Europe and North America. In some jurisdictions unsegregated waste is collected at the curb-side or from waste transfer stations and then sorted into recyclables and unusable waste. Such systems are capable of sorting large volumes of solid waste, salvaging recyclables, and turning the rest into bio-gas and soil conditioner. In San Francisco, the local government established its Mandatory Recycling and Composting Ordinance in support of its goal of "Zero waste by 2020", requiring everyone in the city to keep recyclables and compostables out of the landfill. The three streams are collected with the curbside "Fantastic 3" bin system – blue for recyclables, green for compostables, and black for landfill-bound materials – provided to residents and businesses and serviced by San Francisco's sole refuse hauler, Recology. The City's "Pay-As-You-Throw" system charges customers by the volume of landfill-bound materials, which provides a financial incentive to separate recyclables and compostables from other discards. The City's Department of the Environment's Zero Waste Program has led the City to achieve 80% diversion, the highest diversion rate in North America. Other businesses such as Waste Industries use a variety of colors to distinguish between trash and recycling cans. In most developed countries, domestic waste disposal is funded from a national or local tax which may be related to income, or property values. Commercial and industrial waste disposal is typically charged for as a commercial service, often as an integrated charge which includes disposal costs. This practice may encourage disposal contractors to opt for the cheapest disposal option such as landfill rather than the environmentally best solution such as re-use and recycling. In some areas such as Taipei, the city government charges its households and industries for the volume of rubbish they produce. Waste is collected by the city council only if it is put in government issued rubbish bags. This policy has successfully reduced the amount of waste the city produces and increased the recycling rate. Morocco has also seen benefits from implementing a $300 million sanitary landfill system. While it might appear to be a costly investment, the country's government predicts that it has saved them another $440 million in damages, or consequences of failing to dispose of waste properly. A landfill compaction vehicle in action. Incineration is a disposal method in which solid organic wastes are subjected to combustion so as to convert them into residue and gaseous products. This method is useful for disposal of both municipal solid waste and solid residue from waste water treatment. This process reduces the volumes of solid waste by 80 to 95 percent. Incineration and other high temperature waste treatment systems are sometimes described as "thermal treatment". Incinerators convert waste materials into heat, gas, steam, and ash. Incineration is common in countries such as Japan where land is more scarce, as the facilities generally do not require as much area as landfills. Waste-to-energy (WtE) or energy-from-waste (EfW) are broad terms for facilities that burn waste in a furnace or boiler to generate heat, steam or electricity. Combustion in an incinerator is not always perfect and there have been concerns about pollutants in gaseous emissions from incinerator stacks. Particular concern has focused on some very persistent organic compounds such as dioxins, furans, and PAHs, which may be created and which may have serious environmental consequences. Recycling is a resource recovery practice that refers to the collection and reuse of waste materials such as empty beverage containers. The materials from which the items are made can be reprocessed into new products. Material for recycling may be collected separately from general waste using dedicated bins and collection vehicles, a procedure called kerbside collection. In some communities, the owner of the waste is required to separate the materials into different bins (e.g. for paper, plastics, metals) prior to its collection. In other communities, all recyclable materials are placed in a single bin for collection, and the sorting is handled later at a central facility. The latter method is known as "single-stream recycling." The most common consumer products recycled include aluminium such as beverage cans, copper such as wire, steel from food and aerosol cans, old steel furnishings or equipment, rubber tyres, polyethylene and PET bottles, glass bottles and jars, paperboard cartons, newspapers, magazines and light paper, and corrugated fiberboard boxes. The type of material accepted for recycling varies by city and country. Each city and country has different recycling programs in place that can handle the various types of recyclable materials. However, certain variation in acceptance is reflected in the resale value of the material once it is reprocessed. In July 2017, the Chinese government announced an import ban of 24 categories of recyclables and solid waste, including plastic, textiles and mixed paper, placing tremendous impact on developed countries globally, which exported directly or indirectly to China. Recoverable materials that are organic in nature, such as plant material, food scraps, and paper products, can be recovered through composting and digestion processes to decompose the organic matter. The resulting organic material is then recycled as mulch or compost for agricultural or landscaping purposes. In addition, waste gas from the process (such as methane) can be captured and used for generating electricity and heat (CHP/cogeneration) maximising efficiencies. The intention of biological processing in waste management is to control and accelerate the natural process of decomposition of organic matter. (See resource recovery). Energy recovery from waste is the conversion of non-recyclable waste materials into usable heat, electricity, or fuel through a variety of processes, including combustion, gasification, pyrolyzation, anaerobic digestion, and landfill gas recovery. This process is often called waste-to-energy. Energy recovery from waste is part of the non-hazardous waste management hierarchy. Using energy recovery to convert non-recyclable waste materials into electricity and heat, generates a renewable energy source and can reduce carbon emissions by offsetting the need for energy from fossil sources as well as reduce methane generation from landfills. Globally, waste-to-energy accounts for 16% of waste management. The energy content of waste products can be harnessed directly by using them as a direct combustion fuel, or indirectly by processing them into another type of fuel. Thermal treatment ranges from using waste as a fuel source for cooking or heating and the use of the gas fuel (see above), to fuel for boilers to generate steam and electricity in a turbine. Pyrolysis and gasification are two related forms of thermal treatment where waste materials are heated to high temperatures with limited oxygen availability. The process usually occurs in a sealed vessel under high pressure. Pyrolysis of solid waste converts the material into solid, liquid and gas products. The liquid and gas can be burnt to produce energy or refined into other chemical products (chemical refinery). The solid residue (char) can be further refined into products such as activated carbon. Gasification and advanced Plasma arc gasification are used to convert organic materials directly into a synthetic gas (syngas) composed of carbon monoxide and hydrogen. The gas is then burnt to produce electricity and steam. An alternative to pyrolysis is high temperature and pressure supercritical water decomposition (hydrothermal monophasic oxidation). Pyrolysis is often used to convert many types of domestic and industrial residues into a recovered fuel. Different types of waste input (such as plant waste, food waste, tyres) placed in the pyrolysis process potentially yield an alternative to fossil fuels. Pyrolysis is a process of thermo-chemical decomposition of organic materials by heat in the absence of stoichiometric quantities of oxygen; the decomposition produces various hydrocarbon gases. During pyrolysis, the molecules of object vibrate at high frequencies to an extent that molecules start breaking down. The rate of pyrolysis increases with temperature. In industrial applications, temperatures are above 430 °C (800 °F). Slow pyrolysis produces gases and solid charcoal. Pyrolysis hold promise for conversion of waste biomass into useful liquid fuel. Pyrolysis of waste wood and plastics can potentially produce fuel. The solids left from pyrolysis contain metals, glass, sand and pyrolysis coke which does not convert to gas. Compared to the process of incineration, certain types of pyrolysis processes release less harmful by-products that contain alkali metals, sulphur, and chlorine. However, pyrolysis of some waste yields gasses which impact the environment such as HCl and SO2. Resource recovery is the systematic diversion of waste, which was intended for disposal, for a specific next use. 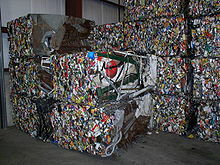 It is the processing of recyclables to extract or recover materials and resources, or convert to energy. These activities are performed at a resource recovery facility. Resource recovery is not only environmentally important, but it is also cost-effective. It decreases the amount of waste for disposal, saves space in landfills, and conserves natural resources. 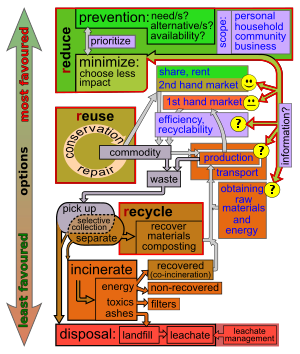 Resource recovery (as opposed to waste management) uses LCA (life cycle analysis) attempts to offer alternatives to waste management. For mixed MSW (Municipal Solid Waste) a number of broad studies have indicated that administration, source separation and collection followed by reuse and recycling of the non-organic fraction and energy and compost/fertilizer production of the organic material via anaerobic digestion to be the favoured path. As an example of how resource recycling can be beneficial, many items thrown away contain metals which can be recycled to create a profit, such as the components in circuit boards. Wood chippings in pallets and other packaging materials can be recycled to useful products for horticultural. The recycled chips can cover paths, walkways, or arena surfaces. The management of waste is a key component in a business' ability to maintain ISO14001 accreditation. The standard encourages companies to improve their environmental efficiencies each year by eliminating waste through resource recovery practices. One way to do this is by adopting resource recovery practices like recycling materials such as glass, food scraps, paper and cardboard, plastic bottles and metal. Recycled materials can often be sold to the construction industry. Many inorganic waste streams can be used to produce materials for construction. Concrete and bricks can be recycled as artificial gravel. This topic was on the agenda of the International WASCON conference in Spain in June 2015 and on the international Conference on Green Urbanism, held in Italy 12–14 October 2016. Sewage sludge is produced by waste water treatment processes. Due to rapid urbanization, there has been an increase in municipal waste water that results 0.1–30.8 kg of sewage per population equivalent per year (kg/p.e/year). Common disposal practices of sewage sludge are incineration, composting, and landfill. An important method of waste management is the prevention of waste material being created, also known as waste reduction. Methods of avoidance include reuse of second-hand products, repairing broken items instead of buying new ones, designing products to be refillable or reusable (such as cotton instead of plastic shopping bags), encouraging consumers to avoid using disposable products (such as disposable cutlery), removing any food/liquid remains from cans and packaging, and designing products that use less material to achieve the same purpose (for example, lightweighting of beverage cans). While waste transport within a given country falls under national regulations, trans-boundary movement of waste is often subject to international treaties. A major concern to many countries in the world has been hazardous waste. The Basel Convention, ratified by 172 countries, deprecates movement of hazardous waste from developed to less developed countries. The provisions of the Basel convention have been integrated into the EU waste shipment regulation. Radioactive waste, although considered hazardous, does not fall under the jurisdiction of the Basel Convention. Economic – Improving economic efficiency through the means of resource use, treatment and disposal and creating markets for recycles can lead to efficient practices in the production and consumption of products and materials resulting in valuable materials being recovered for reuse and the potential for new jobs and new business opportunities. Social – By reducing adverse impacts on health by proper waste management practises, the resulting consequences are more appealing civic communities. Better social advantages can lead to new sources of employment and potentially lifting communities out of poverty especially in some of the developing poorer countries and cities. Environmental – Reducing or eliminating adverse impacts on the environment through reducing, reusing and recycling, and minimizing resource extraction can result in improved air and water quality and help in the reduction of greenhouse gas emissions. Traditionally, the waste management industry has been a late adopter of new technologies such as RFID (Radio Frequency Identification) tags, GPS and integrated software packages which enable better quality data to be collected without the use of estimation or manual data entry. ^ "United Nations Statistics Division - Environment Statistics". unstats.un.org. Retrieved 3 March 2017. ^ "Editorial Board/Aims & Scope". Waste Management. 34 (3): IFC. March 2014. doi:10.1016/S0956-053X(14)00026-9. ^ Davidson, Gary (June 2011). "Waste Management Practices: Literature Review" (PDF). Dalhousie University - Office of Sustainability. Retrieved 3 March 2017. ^ "Glossary of environmental and waste management terms". Handbook of Solid Waste Management and Waste Minimization Technologies. Butterworth-Heinemann. 2003. pp. 337–465. doi:10.1016/B978-075067507-9/50010-3. ISBN 9780750675079. ^ Albert, Raleigh (4 August 2011). "The Proper Care and Use of a Garbage Disposal". Disposal Mag. Retrieved 3 March 2017. ^ a b c d e f g Guidelines for National Waste Management Strategies Moving from Challenges to Opportunities (PDF). United Nations Environmental Programme. 2013. ISBN 978-92-807-3333-4. .
^ Barbalace, Roberta Crowell (1 August 2003). "The History of Waste". EnvironmentalChemistry.com. Retrieved 9 December 2013. ^ a b Herbert, Lewis (2007). "Centenary History of Waste and Waste Managers in London and South East England". Chartered Institution of Wastes Management. ^ a b National Waste & Recycling Association. "History of Solid Waste Management". Washington, D.C. Retrieved 9 December 2013. ^ Gandy, Matthew (1994). Recycling and the Politics of Urban Waste. Earthscan. ISBN 9781853831683. ^ "Covered Bodies". Archived from the original on 6 January 2015. ^ "How the world should cope with its growing piles of rubbish". The Economist. Retrieved 3 October 2018. ^ City of Chicago, Illinois. Department of Streets and Sanitation. "What is Single Stream Recycling." Accessed 2013-12-09. ^ Montgomery County, Maryland. Division of Solid Waste Services. "Curbside Collection." Accessed 2013-12-09. ^ Walker, T. R. (2018). China's ban on imported plastic waste could be a game changer. Nature, 553(7689), 405-405. ^ a b "Energy Recovery from Waste". USEPA. 2014. ^ "Waste Hierarchy". New Energy Corporation. 2014. ^ Czajczyńska, D.; Anguilano, L.; Ghazal, H.; Krzyżyńska, R.; Reynolds, A.J. ; Spencer, N.; Jouhara, H. (September 2017). "Potential of pyrolysis processes in the waste management sector". Thermal Science and Engineering Progress. 3: 171–197. doi:10.1016/j.tsep.2017.06.003. ^ Chen, Dezhen; Yin, Lijie; Wang, Huan; He, Pinjing (December 2014). "Pyrolysis technologies for municipal solid waste: A review". Waste Management. 34 (12): 2466–2486. doi:10.1016/j.wasman.2014.08.004. PMID 25256662. ^ "Frequent Questions". USEPA. 2012. ^ a b "Resource Recovery". Government of Montana. 2012. ^ a b "What is Resource Recovery?". Grand Traverse County. 2006. ^ Syed Shatir, A. Syed-Hassan; Wang, Yi; Hu, Song; Su, Sheng; Xiang, Jun (December 2017). "Thermochemical processing of sewage sludge to energy and fuel: Fundamentals, challenges and considerations". Renewable and Sustainable Energy Reviews. 80: 888–913. doi:10.1016/j.rser.2017.05.262. ^ "Removing food remains to reduce waste". Recycling Guide. 14 February 2008. Retrieved 25 September 2012. ^ Schneider, Michael; Johnson, Liz. "Lightweighting". Projects in Scientific Computing. Pittsburgh Supercomputing Center, Carnegie Mellon University, University of Pittsburgh. Retrieved 25 September 2012. ^ Abarca Guerrero, Lilliana; Maas, Ger; Hogland, William (2013). "Solid waste management challenges for cities in developing countries". Waste Management. 33 (1): 220–232. doi:10.1016/j.wasman.2012.09.008. PMID 23098815. ^ Claire Swedberg (4 February 2014). "Air-Trak Brings Visibility to Waste Management". RFID Journal. Retrieved 1 October 2015. Wikimedia Commons has media related to Waste management.